I've been making a number of prototype paddles at the request of a friend and promoter of my paddles. After a number of weeks I came up with two winners. One is a bent shaft Greenland style paddle. The other is an Aleut style paddle with some amount of extra bend added to it. There were some other paddles in the mix that weren't winners but they were instrumental in helping me figure out the specifics of what made the winning models work. I have made Greenland style bent shaft paddles before and quite by luck come up with the right design, but this time, I did some deviation from the winning model only to find that the original was still the best. The Greenland style bent shaft may actually have originated in East Greenland as reported by John Brand who found some examples of these paddles in museums and originally thought that they were just straight paddles that had warped over time, but after some reflection decided that they were actually made that way on purpose. The bent shaft Aleut paddle is not completely new. I had made two of these before for a friend but never actually paddled them myself. This time around I did use the bent shaft Aleut paddle and found it to be a useful variation on the standard version that I usually make. Four paddles out for a test run. 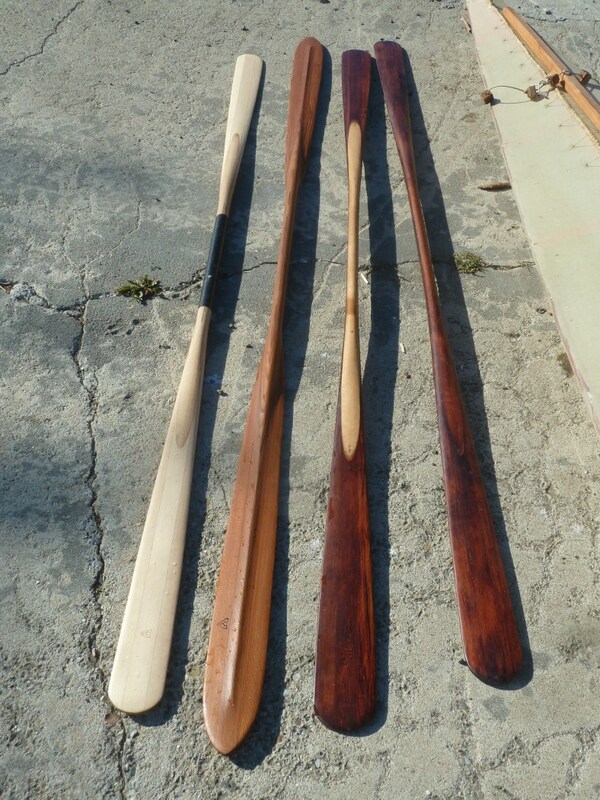 From left to right, a Greenland breakdown for a customer, an Aleut with some bend in the direction of the ridged face, a Greenland style with significant bend and another Greenland style with moderate bend. One of the key aspects of a Greenland paddle is that it is highly symmetrical, that is, no matter how you hold it, its performance is the same. The Aleut paddle by contrast has a lower degree of symmetry. You can switch right and left blades without changing performance but you cannot change ridged face for flat face without changing performance. The reason is that in one configuration, the face of the paddle trails the axis of the loom while in the other, it leads the axis of the loom. Although the amount of offset is small, it nevertheless makes a difference in the way you need to move the paddle through the water to get it to work. The same is true of the bent shaft Greenland paddle. The slight amount of offset of the blade has it either leading or trailing the axis of the loom depending on how you hold it. My insight while doing the testing on the bent shaft paddles was that when you pull a paddle through the water, you move it through an arc during which the angle the blade makes with the water changes. The efficiency of the paddle is at its greatest when the blade is perpendicular to the surface of the water. As the stroke progresses, the angle the blade makes with the water changes from the vertical and the amount of force you exert that translates into forward motion decreases. At the same time, the boat is accelerating forward and the water is accelerating backward so that as the stroke progresses it becomes less efficient. So having the shaft bent to make the blade more vertical at entry into the water improves its efficiency. On the other hand, when the paddle is used in a low angle cruising position, that is, with the loom held low and close to the deck then the paddle held so that the blade trails the loom makes the blade self orienting and requires less of a tight grip to keep it properly oriented. While this stroke generates less thrust than the high angle stroke, it is more efficient at lower cruising speed and less tiring in headwind conditions or against the current conditions. Whether my understanding of the mechanics of these paddles is correct or not, the fact is that they work in practice as confirmed by speed trials with a GPS. What is the performance difference you experienced with the Aleut bent paddle? Did I read it correctly, that the bend is inward on the power ridged side, rather than outward? Why that way? Thanks. Yes, you read correctly. I made two bent shaft paddles one bent toward the ridged face and one bent toward the flat face. I preferred the one bent toward the ridged face when paddled ridged face back. The effect of the bend is to allow the paddle to generate slightly more thrust when paddled ridge back. For a high angle stroke, the bend allows the paddle to enter the water in a more vertical (front to back) orientation. The bend is a few degrees at most and the effect of it is subtle. I will measure the actual angle and report that when I measure it. I did another paddle with maybe two more degrees of bend and found it to be less comfortable. More experimentation in this realm is forthcoming.